Your Silvertracker.net site is the hub of all activity gathered with the Silvertrac App by officers in the field. A feature of your silvertracker.net site is that the residents and tenants of the properties that you provide security for can access the site to report Security and Maintenance issues without having to login with a user name and password. As a means of convenience many choose to make a link available to tenants and residents to access directly from their website. To access the appropriate links and add a Silvertrac "Login" Button to your website access the System Tab and click on "System Config".Under the "General: Tab the box containing External URL Links will display. 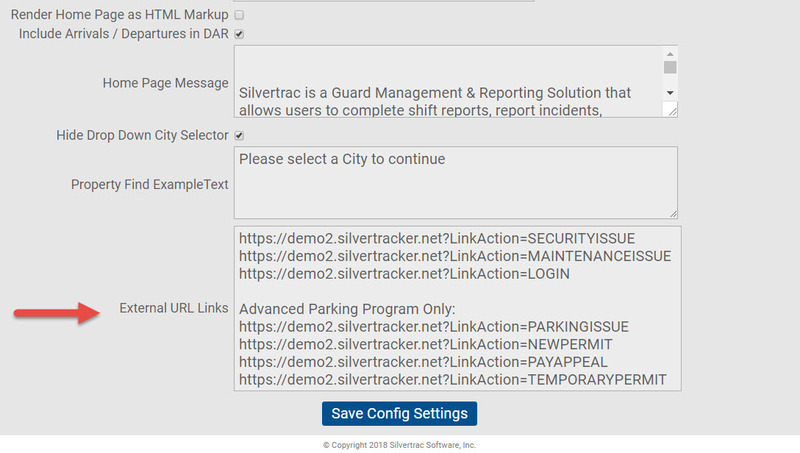 These links can be embedded in your website by your webmaster to allow quick access to the Silvertracker.net site to report Security and Maintenance issues.